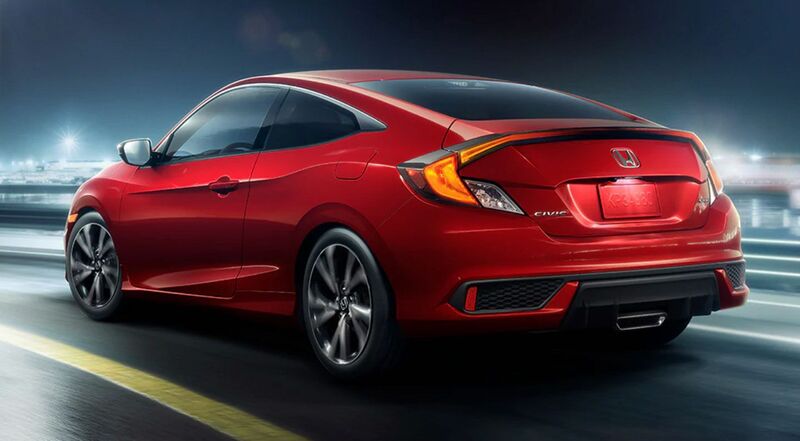 Built with an aggressive stance and an exclusive rear taillight design, the sleek profile of the new Civic Coupe distinguishes the 2019 model from its predecessors. Along with sophisticated body lines a statement-making Sport trim, the 2019 Honda Civic Coupe is a force to be reckoned with. Drivers will enjoy Honda Sensing® standard along with heated front seats, electronic parking brake, ergonomic center console and sport pedals. Visit Premier Honda in New Orleans, Louisiana to find your Civic Coupe now! Honda looks after your automotive safety and comfort in their new coupe. With its premium materials, high-tech safety features, and sleek styling, the new Civic Coupe quickly distinguishes itself from other cars in its class. The Honda Sensing® safety package is full of driver-assist technologies engineered to help you handle the unexpected and alert you to things you might miss on the roads of Metairie and Kenner. Along with its attractive styling, the new Civic Coupe offers a fully-independent suspension and up to 174 horsepower from the turbocharged engine on the EX and Touring trims. The naturally aspirated Civic Coupe LX and Sport trims are motivated by a 2.0-Liter engine that delivers 158 horsepower and an EPA-estimated 39 MPG on the highway. For drivers who like to row through the gears, we suggest the Sport trim with a 6-speed manual transmission. Which trim model will excite your daily drive? If your Honda lease is ending, you are in luck. The 2019 Honda Civic Coupe is now for sale at our local Honda dealer. Stop Premier Honda for a test drive of the new Civic Sport and enjoy the available CVT with Paddle Shifters and Apple CarPlay™ integration. Maybe you want a 1.5-Liter turbocharged engine and heated front seats. If that's the case, the Civic EX is the new coupe for you. Of course, there's also the Civic Touring that comes with leather-trimmed seats and LED Headlights with Auto-on/off. The driver-focused cabin of the 2019 Civic Coupe features sporty details, effortless features, premium comforts, and leading technologies. Take a tour and activate the heated seats during your informative test drive. You'll notice that the ergonomic display is easy to read so you can enjoy the sites of New Orleans. Don't miss the new Sport trim with its racing-inspired pedals. Taking a walk around the 2019 Civic Coupe, one's eye immediately notices LED headlights that create an iconic lighting signature. The sophisticated profile lines of the Civic Coupe all come together to form the right angle that looks fast while standing still. The Sport trim is easily recognizable thanks to the center-mounted exhaust and 18-Inch alloy wheels. At Honda, safety is standard. Every 2019 Civic Coupe comes standard with Honda Sensing®. Discover the feeling of security that comes over you with Adaptive Cruise Control, Collision Mitigation Braking, Road Departure Mitigation, and Lane Keep Assist helping to protect you and your passengers. Visit our new and used Honda dealership near Metairie and Kenner.